This is apparently Seattle’s first transit-oriented development (TOD). If it gets better than this with TODs so come, hold on to your seats, you’re in for a fun ride. The starting point is a 9-acre parking lot (left of photo), pretty much your standard building block in many U.S. cities, though adjacent to a major bus transfer station with planned light rail access, which means walkable urban village development is a natural next step. However, one half of what makes this a model for the rest of country is that rather than develop right over the parking block, the public-private partnership between the public and private sectors “daylighted” a creek that was covered by the lot, which as close as you’re going to get in actually creating nature. Within one month after opening, native birds were observed at the project. The restored Thornton Creek also collects urban stormwater runoff from 680 acres. The other half of what makes this a national model is what they did with the rest of the parking lot block (about twice the size of a typical Seattle block), replacing an exclusive hang out for cars with Thornton Place, a habitat for people and no thoroughfare for cars: 109 condos, 278 apartments (20% affordable), a 14-screen cinema, 50,000 sf of retail and a beautiful, vibrant plaza surrounded by restaurants (above). Maybe they’ll eventually enlarge the plaza by replacing the head-on parking spaces with outdoor dining area. 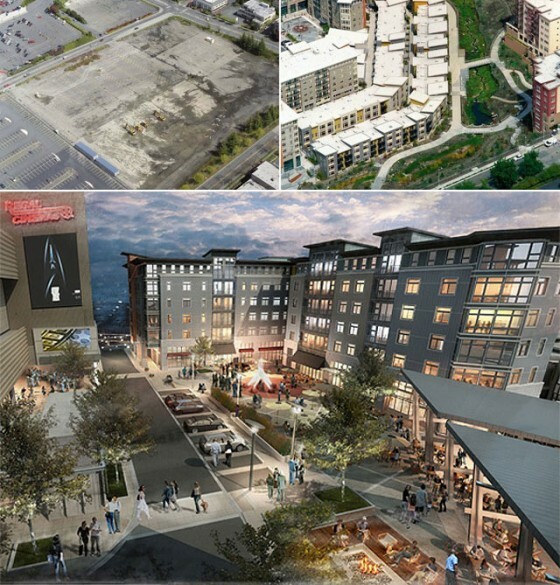 Notice in the aerial (lowest image below) that the development focuses on the plaza as the center of life, with the retail, housing, and even the creek open space organically wrapped around it, ignoring the rigid grid of auto-driven streets and parking lots surrounding it. The residents campaigned against efforts to allow thoroughfares of auto traffic through. Not only that, the developer also campaigned to the City and County to allow 350 of the 880 required parking spaces (underground) to be shared as transit parking, allowing a reduction of the total parking requirement to 200 below what city code normally requires. That’s a savings of $8 million ($40k a stall) that not only add zero value to the overall project, but probably would have added negative value (increased traffic congestion), thus making everything that much more affordable. Also on the site is 143-units of senior housing known as Aljoya within a naturally-occurring retirement community (NORC) context, that is, a place to retire without feeling like you’re in a retirement community cut off from society. Unburied creek. Buried parking. Vibrant urban plaza. No thoroughfares for cars. Should it be surprising the development company, Stellar Development, is Swedish, renowned for their sustainability movement? Read about the development from a more authentic creatives point of view in Grist and HugeAssCity. Wonderful. Hopefully the property owners around it will follow suit (pretty horrid parking lots adjacent). What’s your take on the City Creek development in SLC? Thanks for the reference Adam. On paper it sounds fantastic, though if you take the virtual tour you can see the daylighted creek is treated more as a feature of a shopping mall lined with national chain stores than a wildlife habitat.it’s more of a corporate cultural district with a predominant focus on chains and luxury housing, but it does provide a largely car-free urban district in the downtown, and that’s a major plus.